You sell as much as you think you should. Your subconscious mind is controlling the level of success you have in your sales career. I provide you with proof and some ideas about how you can break through and sell more and make more money. Have a look at this video and then keep reading. It’s the weekend, and I’m working on the mindset section of my book. Here’s the video that goes along with some of the things that I’m thinking about, some of the things that I’m working on for the book. This is, probably, the most powerful stuff in the book. I know you’re going to get tactics up the wazoo. You’re going to get strategies, you’re going to get things that you can implement today to make more money, and all those things are fantastic. 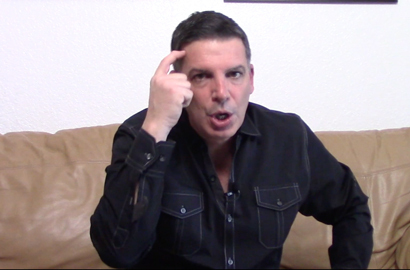 The mindset stuff that I cover, like what I’m talking about in this video … think about it, put it into practice, and you’ll be amazed at the difference it will make in your life. You’re making exactly what you think you’re worth right now. That’s right. You have a mental set point. Whatever your subconscious believes you’re worth, that’s what you’re making. Let me prove it to you. How often do you make just enough to cover your bills? Or, do you make enough to cover your bills with a little bit of money left over, and then your car breaks down, or you need a new roof on your house. All of a sudden, that little bit extra is gone. You’re in the mindset that you’re only worth that certain amount. You’ve got to change that mindset. Here’s the thing, it affects who you call on and how you present yourself. Right now, if you think you’re only a $100,000 salesperson, you’re not going to call on someone that could give you a million dollar contract. If you think you’re only a million dollar person, you’re not going to call on someone who’s going to give you a $10 million a year contract. Fix your mindset, grow your business. That’s the bottom line. So how can you do this? I’m going to give you three things to do, three things to focus on right now so that you can change your mindset like that. The first thing you need to do, immediately change the people who are around you. If you hang out with people who make $100,000, you’re going to make maybe 150 in your best year, 250, $300,000, and you’ll be the most successful person in that crowd. That’s wrong. Hang out with people who make a million dollars, 1.5 million, 2 million, $10 million a year. Hang out with billionaires. Notice how your mindset changes. You have different conversations when you are around people who make 10 million, 20 million, $100 million. You start thinking differently when you change the environment that you’re in. That’s the first thing you have to do. Forget about this inferiority complex you have that you’re not going to fit in. People are people. Flesh, blood, it’s all in there. People are the same. It’s just the mindset they have that’s different. So that’s the first thing. Change the environment that you’re in. The second thing you need to do, treat yourself like you’re worth a million bucks, and then when you get to that point, when you’re making a million bucks, treat yourself like you’re worth ten million bucks. And then, when you’re making $10,000,000, treat yourself like you’re worth $100,000,000. I don’t eat airplane food. I don’t care how long the trip is. If it’s a long trip, I’ll bring my own food, but I don’t eat airplane food. But I fly first class, even on the shortest trips. Why? Because, when I’m flying on a business trip, and I get off the plane first, and I walk into a car that’s waiting with a guy who had my name, he’s holding up a sign with my name on it, I feel like I can take on the world. That attitude comes across when I walk into a sales meeting, or when I walk into a presentation room. I’m willing to pay the extra money to have that feeling. Okay? It’s the little things that reinforce the mindset, that help you shift that barometer, that mental set point in your mind. That set point in your mind. That mental set point. Treat yourself like you’re worth where you want to be. Treat yourself right now like you’re worth a million dollars. If you were worth a million dollars, would you be sitting in the back of the plane? Would you be paying $50 for a checked bag? Would you be fighting and elbowing with people in a line, like sheep or cattle, in order to get on a plane? Hell no. You’d be getting on a plane when they call group 1. You’d be going, “Excuse me”, like I do, and walk through everybody else to get to the front of the plane. Or even better, you’d have somebody meeting you at the airport, at the doors to the airport, like I do sometimes on long trips when I opt for the American Airlines concierge program. You can pay a couple of bucks extra and they’ll meet you at the door. They’ll walk you through security. They’ll carry your bags for you, and they’ll walk you right onto the plane before anybody else is called to board. The pilot shakes your hand. For a couple of bucks more. And I mean, only a couple of bucks more, you feel like a million dollars. If you’re going to a big meeting, and you treat yourself that way, your mindset is different when you get to the place where you’re headed. All right. That’s the second thing. Treat yourself like you’re worth a million dollars. Hang around with people who are in a financial position that’s different than you. Hang around with people who would be your ideal client if you were writing million dollar contracts. That’s the first. Second, treat yourself like you’re worth a million dollars. The third thing that you need to do, and you need to do this right now is, stop worrying about money. I know, I know. You’re sitting up at night. The reason you’re watching this video is to figure out how to make more money, right? Stop worrying about money, and start thinking about the value you deliver. I got an email yesterday. It was 9:00 on a Friday night, from a guy who was still in his office working, and he’s happy to be working because he’s making 20% more on a deal he just closed because he used a strategy that I gave him on the phone on Tuesday. On Tuesday, I gave him the strategy. On Wednesday, the client said yes. On Thursday, he went and got the paperwork. On Friday, he started working on the deal. Friday night, he’s in his office, happily working because he made 20% more by making one little tweak. And by the way, that one little tweak was presenting the value he had to offer in a different way. That’s the whole point of this, right? Present your value. Offer your value. Think about your value. Stop worrying about money, and start thinking about the value you have to provide to people. Frame the value you have to provide to people in a way that they recognize it, and they’re willing to compensate you for it. Three things. Number one, hand around with people who have achieved the level of success you want to achieve. Hang around with people who can afford the products or services you want to sell them. Number two, treat yourself like you’re worth a million bucks. If you’re already worth a million bucks, treat yourself like you’re worth ten million bucks. And the third thing, most importantly of all, stop worrying about money. Stop thinking money. Start thinking about value. Start talking about value. Communicate in the language of value, and not in the language of money, and you’ll notice how things change for you. Do these three things, and you will increase your net worth. Do these three things, and you’ll increase the amount you sell. That’s what I’ve been working on for my book today. If you like this, the name of the book is The 60 Second Sale. There’s more great stuff like this in that book. It’s the best sales book you’re ever going to read. Go out and pick up a copy right now. The 60 Second Sale. I’m Dave Lorenzo. We’ll talk to you again soon.